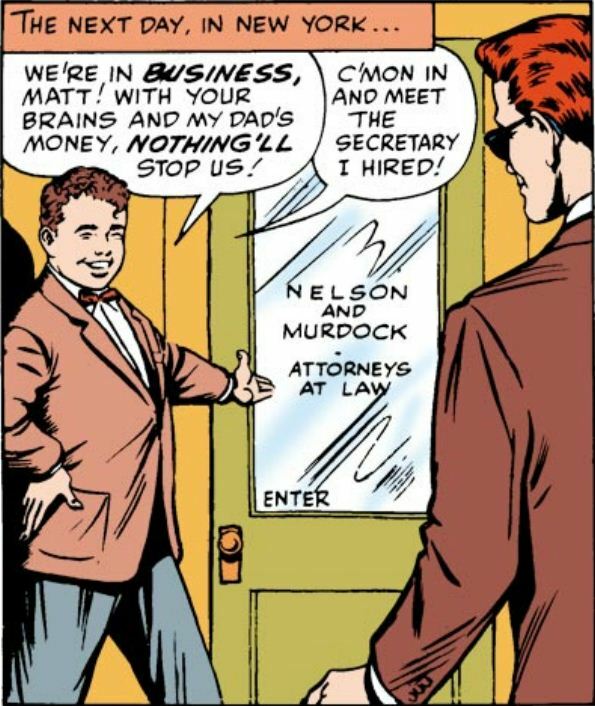 Too often, Franklin “Foggy” Nelson has been standing in the shadow of his law partner. However, over the years, Foggy has often proven himself to be an excellent attorney, keeping the business going while Matt has been “busy” elsewhere. So, the question is if Foggy isn’t selling himself a little short here in Daredevil #1? Thankfully, later writers have done a very good job of giving the Fogster the respect he deserves. Mmmh… One of Foggy’s charms -bowtie apart- is that, most of the time (for of course it is variable depending on the writer) he’s so charmingly self-deprecating, and then being able to deliver the lawyering goods seemingly out of nowhere (with one of those, unexpected near-forgotten precedents). Good writers know that Foggy is one heck of a lawyah (bad ones just have him there just to hold Matt’s cabe).